Help Teaching now offers Test Room, an online assessment platform designed for teachers, parents, tutors, and trainers. 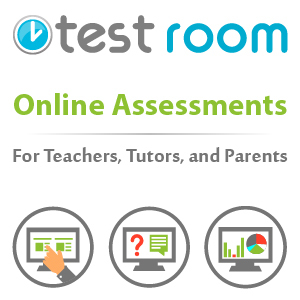 Test Room gives educators the power to administer assessments online. It also provides statistical data to help educators quickly monitor and assess student and class performance. As an educator, you have many reasons to quiz students and now Test Room provides the convenience, tools, and flexibility to do so in a meaningful way. Whether you want to give a brief quiz to check for understanding or a cumulative course final, Test Room offers numerous features for test scheduling to fit your needs. When you set these time settings your test will only be active during the set time period and can no longer be taken once the time period expires. Be sure to double check all your settings to make sure students can take your test when it’s time for them to start. All of these features are available in the Test Administration section and you’ll find specific boxes and instructions to help you make those choices there . For example, if you want students to be able to navigate back to previous questions to revise their answers, be sure to check the correct box. With the grading feature, you can save a lot of time by letting Test Room do the grading and give students the feedback they want. Even if you choose to manually grade your assessments, you’ll still save time by allowing students to quickly take the test online. To help provide you with a meaningful analysis of student mastery and progress, Test Room generates data on individual student performance and overall test performance. This way you can evaluate trends in individual student progress and test performance. With this data you can monitor how individual students are performing and help make sure the quizzes and tests you assign are producing the desired outcome. I am disappointed that only the computer generated “Tip” can be displayed after the test. I would like to provide “post-test” instructions or messages. I teach a self-paced classroom. I would like to provide a link to the appropriate tutorial if a student fails the test. This keeps the students on task rather than searching a massive list of links in an “if-then” format. How can we minimize cheating, either by students Googling answers, or by having one person help multiple student during cell phone use? Can the questions be randomized on an online administered exam? There is not an option for randomization. You could potentially create multiple versions of a test (just re-arranging the order of questions on each one) and assign different versions to different students. There is a shuffle feature on the portion where you create your own test questions…Perhaps this is what you are referring to? My students don’t have email addresses. They do have access to laptops at school. I would like to be able to let them test at school. How do they log in on a laptop? Will I be able to assign them things? Yes. You can get a link to share with students. Is it possible to share each child’s test result automatically with parents via email? 2. a way to make matching questions – right now they can be made in the fill in he blank section but then it’s an all or none when grading. 3. a way to make some questions worth more than others – i.e. open-ended are all or none right now but having an option for a number of points would be helpful. I’ve used other online testing sites and they have each question be worth a certain number of points, the teacher can put in how many total points he/she is giving the student for their answer.